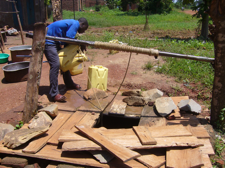 The Ministry of Water and Environment (MWE) and numerous non-Government organisations in Uganda have several years of experience in the promotion of rainwater harvesting for domestic use, as well as the piloting of household-led improvements to hand dug wells. In Uganda. it is becoming clear that there are many households that are able and willing to invest in making improvements to their own water supplies – known as Self Supply. Project Manager: Dr Kerstin Danert, Project Staff: André Olschewski. The Rural Water Supply Network (RWSN) is encouraging government authorities, NGOs and the private sector to recognise the fact that many households and small groups can actually construct, or pay for the construction of wells and rainwater harvesting facilities. Self Supply refers to cases when households improve water quality or their access to water supply by incrementally upgrading existing water sources, undertaking household water treatment, or a combination of the two. The promotion of household investments to improve rural water supplies in Uganda started in the 1990s with the training of masons for the construction of domestic roofwater harvesting facilities and promotion of the technology, followed by a study on Self Supply and piloting of this approach in 2007/8. Since then, MWE has continued to promote household investments alongside its conventional rural water supply programmes whereby Government invests heavily in infrastructure development. With this project, Skat provided support to MWE to prepare a Guiding Framework for Accelerating Access to Safe and Reliable Water through Self Supply in Uganda. The guiding framework will address a number of outstanding issues including the development of clear guidelines, training of the private sector, links to planning and financial mechanisms, advocacy and policy dialogue. Skat also helped to bring stakeholders involved in promoting Self Supply approaches around the table to plan their activities in a coordinated manner.